With the S&P 500 trading at rich valuations, many in the investment community are looking for value in the face of ever higher prices. OTAS can show you where the valuations are most stretched as well as pointing out names with the most value compared to comps. 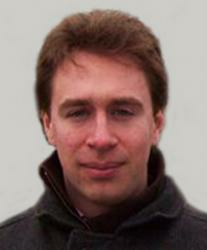 Wendel – Reweight the Investor ? As diversified investment play Wendel approaches its mid-year trading update on the 5th June, we note multiple factors in OTAS which highlight potentially growing signs of risk to the shares. Having underperformed its peers for most of 2014, Wendel shares have enjoyed a solid start to 2015 rallying +26% year to date in line with that of the sector whilst outperforming by +2.75% in the last week as we head into its Company release. The shares now lie back at the recent multi-year highs seen in mid-April and are adopting similar technicals to then – looking overbought on all 3 stochastic measures (Fast, Slow & Full) and a similarly high RSI reading. The shares subsequently fell -7% in the following month. Further signs of risk in the Core Summary centre on Director Dealings and Valuation. 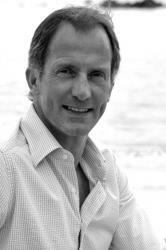 Current CFO Jean Michel Ropert has sold €300k worth of stock prior to the trading update. Our unique back-test and ranking identifies Mr Ropert as being the most reliable Wendel director to follow when he has historically sold stock. He currently holds the highest, 3 star ranking. From a more fundamental stand point Wendel’s current 12m Fwd P/E valuation is looking particularly stretched. Trading on a peak 8 year multiple of 18.9x it is at unprecedented levels in absolute terms and at a 46% premium to the sector, levels at which the shares have struggle to significantly re-rate from. Analyst EPS estimates have been revised upwards by just over +2% in the last month having seen heavy downgrades the month before. The market price action over this time period has largely followed in line (Divergence Stamp) with the shares +4.2%. The stock is a consensus Buy and trades at a 3% discount to its current median price target. Of the sentiment risk indicators on OTAS, CDS has seen the most notable move. From the lows in March, Wendels credit risk has increased 65%, currently standing at 110bps. It is interesting to note the idiosyncratic relationship between this and the share price which has also rallied over this time. I thought I’d share this microstructure example I have been following intraday, as it highlights how useful our TradeShaper alerts are for illiquid stocks. I actually hadn’t heard of Areva before today (despite its €3.5 billion mkt cap it typically only trades 98k shares a day), but it’s involved in mining uranium and designing/constructing nuclear reactors, as well as renewable energy development. The stock is up 17% MTD after EDF put in a bid for Areva’s nuclear reactor business arm. Pretty cool stuff, although I digress…let’s focus on the microstructure. …ta da, very visible sellers (ask liquidity 32x what we would expect on a Tuesday at 10:53, to be more specific). Now given the fact the stock is underperforming the basket, there is loads of liquidity on offer and the spread is within its normal range you could argue buyers have an (adequate) reason to transact. However, don’t forget SELLERS HAVE JUST MASSIVELY LOADED THE OFFER. Personally I’d be more than happy to sit on the bid and let the sellers come to me, but they do call me “Captain Hindsight”. Wow, it looks like that is exactly what happened, albeit it took more than 2 hours for sellers to get bored and start hitting bids. Talk about cost savings if you had gotten this alert, the stock has moved 212 bps. Sellers could have gone on risk to their broker given this information and buyers could have been very passive indeed. Salesforce.com reported earnings this morning that beat estimates as well as the company raised forward guidance. The stock is trading up over 4% today on this news, but the momentum has since waned. 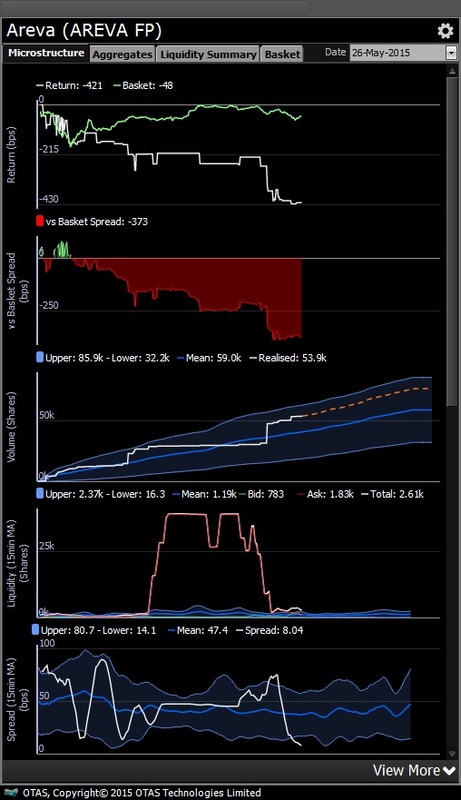 Using the information in the Microstructure in Tradeshaper, you can see where the trading activity is coming from to help you best determine your trading strategy. 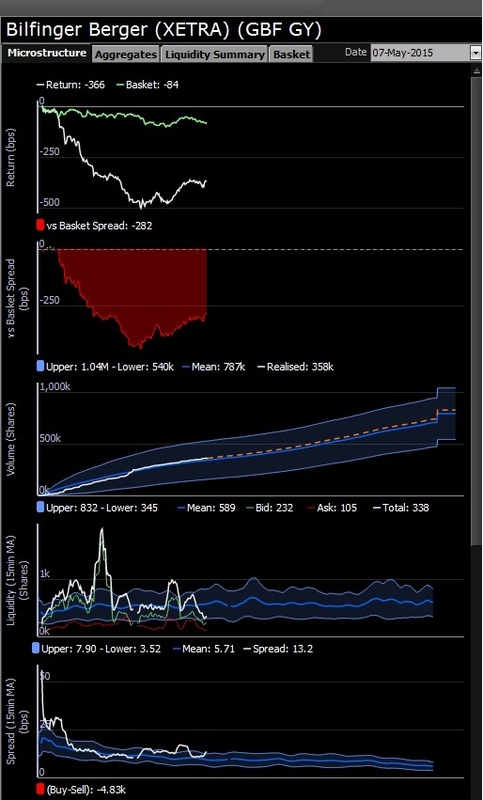 As sellers started to take advantage of liquidity and the strong demand to buy stock, the Microstructure allows you to use this transparency to adjust how you are trading. At 10:49am, there was an increase in Bid-side Liquidity. The stock immediately began trading down as this liquidity unearthed sellers who were willing to hit the bids. 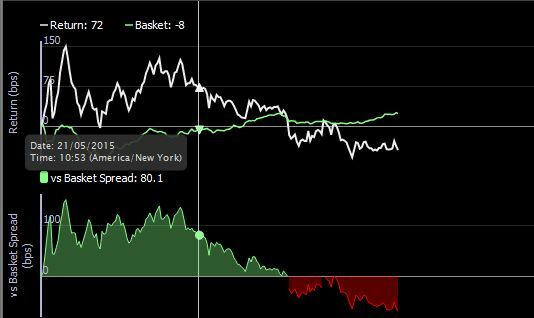 The stock began to under perform its bespoke basket as sellers were given more bid-side liquidity. Only when the bid-side liquidity dried up, did the stock price stabilize. Like a punch drunk boxer longing for the final bell, HSBC’s long suffering shareholders now seek light at the end of what has been a very long tunnel. Many blows have been conceded by the banking behemoth over the past few years to the point where a full UK exit strategy is now being considered. This recent news flow proved a short term fillip for the shares through April but they have since resumed their slide against the sector. 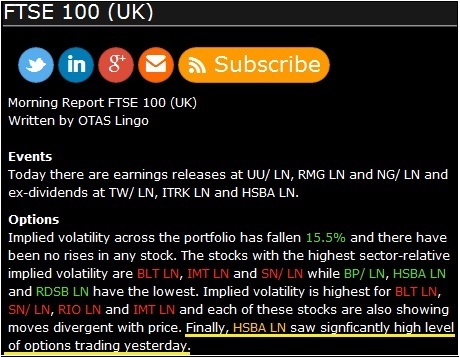 As HSBC further considers it’s options, today’s OTAS Lingo report on the FTSE 100 notes equity options were in unusually high demand for the Company yesterday. Does the derivative market hold the key to the next move in the shares ? Exploring the OTAS Implied Volatility view in more detail highlights some interesting observations in the options market. Given its sheer size and weighting within its respective industry, HSBC’s implied volatility has typically been half that of sector peers over the last 2 years. This relationship has seen a considerable move higher in the last month as the option market prices in a greater degree of share price movement. Current Implied Volatility of 18.4 indicates a +/- 9% trading range over the next 3 months. As noted in the Lingo report above, compared to usual*, traded volume in options yesterday was significantly higher than normal. 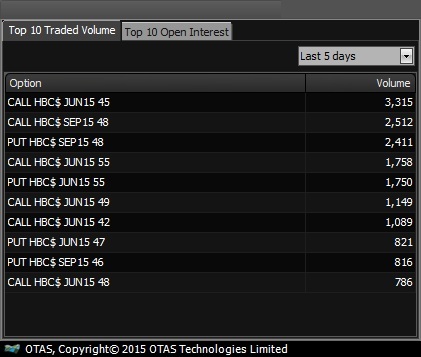 The Top 10 Traded Volume table indicates there was a heavier bias in Calls. Additional factors observed may also indicate a supportive environment for HSBC shares currently. Downside skew (effectively a measure of cost of downside protection) has shown a gradual contraction in the last 2 months and now sits close to its 1 year lows suggesting little directional appetite or position protection demand. This is further evidenced in the Put Ratio which is back towards the lows seen in April. Are Equity investors getting a steer from the derivative markets or is it simply investor complacency ? Given lately there has been a lot of talk about how overvalued bonds currently still are, together with the fact this is an asset class that insurers and reinsurers invest heavily in, let’s talk about Munich RE which flags as a positive stock within the DAX. Arguably Munich RE should invest in high quality, liquid stocks with exposure to QE in Europe…the CEO of Munich RE certainly seems to think so, having purchased 2,000 shares on Friday. This name constitutes 3.44% of the DAX, has a 4.6% 12m fwd divi yield and the risk-sentiment indicators that are short interest, CDS and implied vol. have all seen significant declines over the last 1 month. Observe below how Mr Von Bomhard tends to buy the dips rather well. 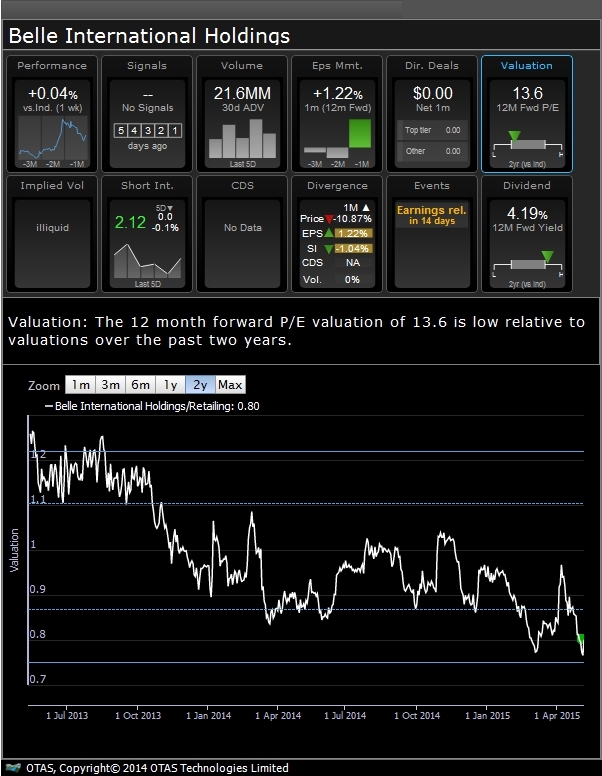 Our new star ranking gives the CEO a 1 star, indicating decent timing historically on a 20 day period (contact your OTAS sales rep for more info on this new feature, coming to you next week). Furthermore, here are his returns over 6 months: 20.3%, 12.5%, 12.6%, 12.7%, 33.0%, 0.84%, 13.3%. Given China’s 3rd interest rate cut in 6 months it is worth comparing how the valuation of the HSI has historically traded against the stoxx 600. As shown below, it is interesting to note how it has typically traded above parity at around 1.2 (with a high of 1.8 in August 2009). Hence with the 12m fwd P/E of the HSI currently trading at a 7% discount to the stoxx 600, it still looks inexpensive by historic standards. Belle International is a company involved in the manufacture, distribution and retail sales of shoes/footwear and sportswear. People need shoes no? 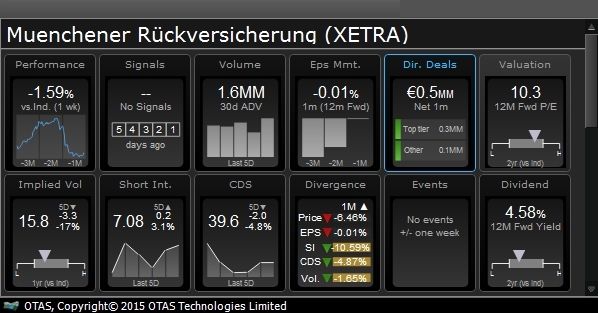 This is highlighted as a top stock on our OTAS online app (it’s free, just enter your email address to access). As shown in the Core Summary, upgrades to 12m fwd EPS over the last 1 month are in the top 10% of the industry, with earnings in 14 days, sector-relative valuation is flagging as a potential opportunity and the forward dividend yield is currently at 4.2% (this is towards multi-year highs and is covered by earnings in FY1 and FY2). Additionally, short interest levels are at 2 year lows and the upgrades to earnings over the last 1 month are notably divergence to the 1 month price action. Stock is currently a consensus BUY. Grifols – One To Watch…. 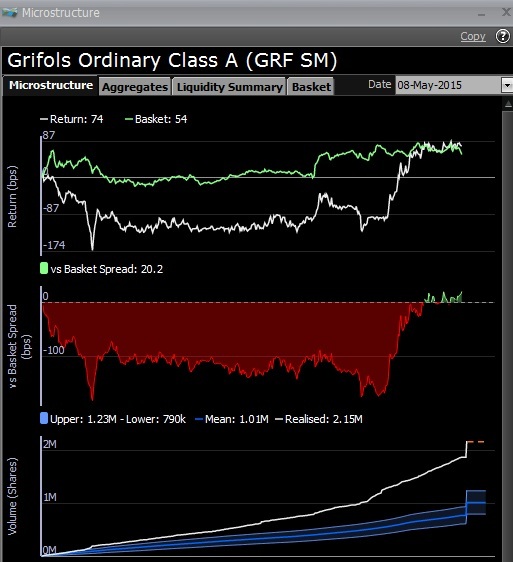 Having touched multi year highs in mid-April, Grifol shares have performed poorly since, exacerbated by recent Antitrust news-flow and underwhelming Q1 numbers. The stock is +9% YTD in absolute terms yet has underperformed the broader sector by -10% over the same period. Strong technicals are now firing and further screening of the stock in OTAS highlights various factors that could suggest the shares may be reaching an area of support. N.B The RSI Buy signal is also close to firing. Keep an eye on todays closing price ! Unusually High volume in the shares on Friday. The Microstructure(Return & Volume charts) shows late aggressive buyers entering the name and closing the underperformance with its basket. Volume is extremely high again today…..
Sector relative P/E valuation beginning to look cheap again. Similar previous lows have acted as a positive re-rating catalyst. Short Interest has seen a marginal decrease in the last week. Although sub-market, Grifols current sector relative 12m fwd yield is high compared to the last 2 years. 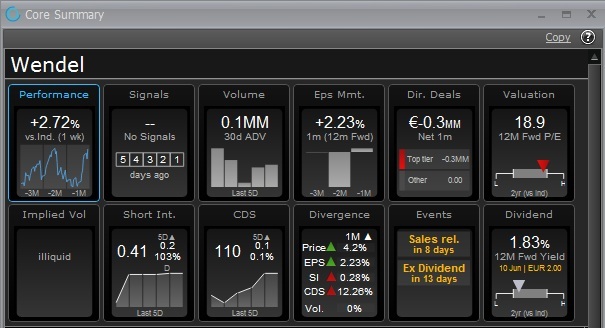 The OTAS Tradeshaper Microstructure gives a real time account of a stocks’ intra-day trading characteristics. 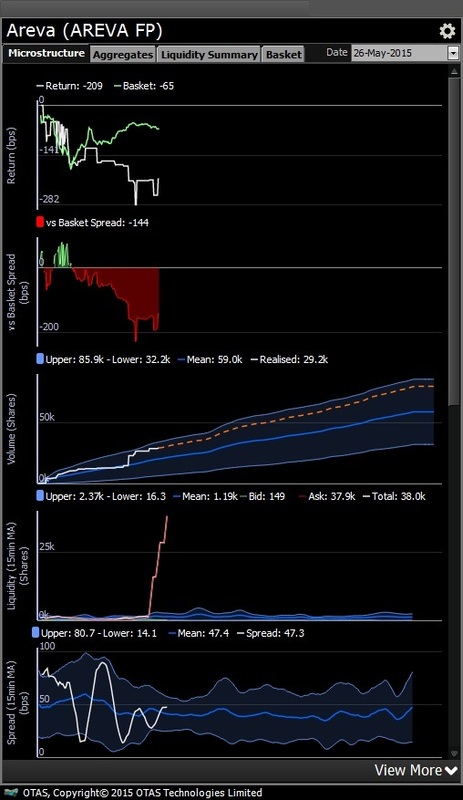 The charts and analytics allow Traders to quickly ascertain what trading strategy to adopt, whilst through OTAS’ unique Alerts function adapt trading behaviour when unusual market conditions are experienced. Would you have monetized the intraday opportunity costs ? From the open Bilfinger alerted as the worst performer in the STOXX600, -400bps vs its bespoke basket. Traded Volume was slightly lighter than usual with aggressive sellers clearly in the ascendency. The Liquidity profile shows buyers(green line on Liquidity chart) increasing their intensity on the down move. 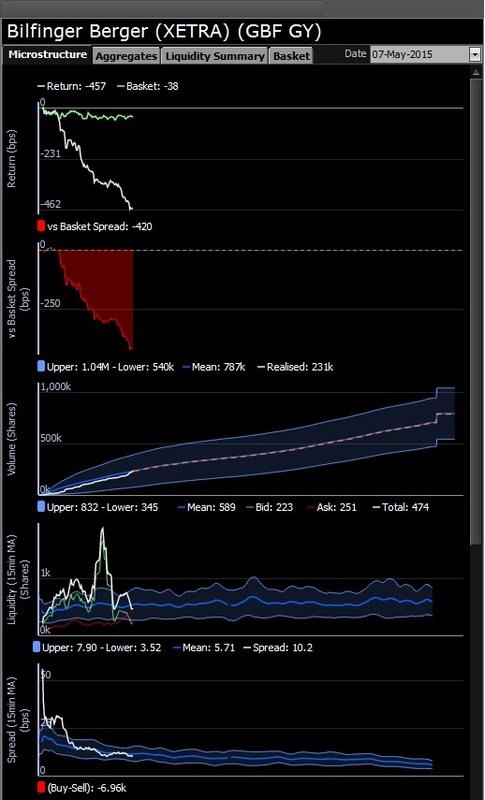 The spread also closed significantly indicating buyers are more willing to engage at these levels. Sellers should consider stepping out of the market or adopting a more passive strategy whilst buyers may want to capture some of the under-performance immediately. Such actions may see the stock revert back towards the basket. This is how the Microstructure looked 2 hours after. Pre-emptively adjusting participation levels could have made or saved meaningful basis points of performance. Yum! 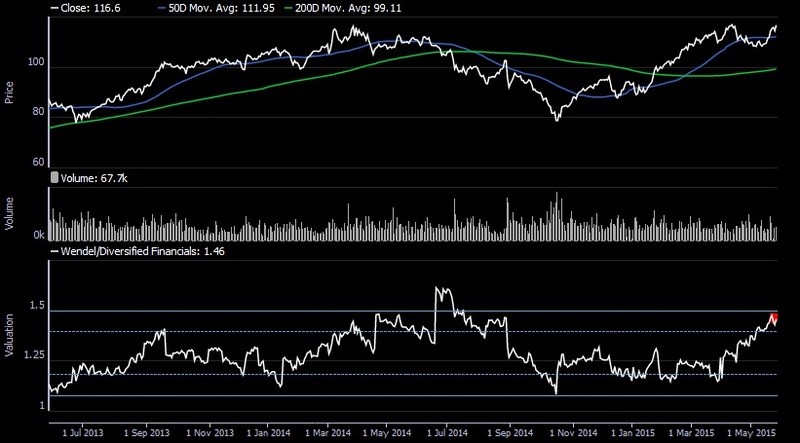 Brands: Are investors hoping for a treat? With Yum! Brands in focus the next week with upcoming analyst meetings in China and India, along with activist investor comments regarding its China business, OTAS can be a helpful tool to determine investor sentiment. YUM has recently broken out vs. the industry and market, +5.10% over the past week vs. the industry group. 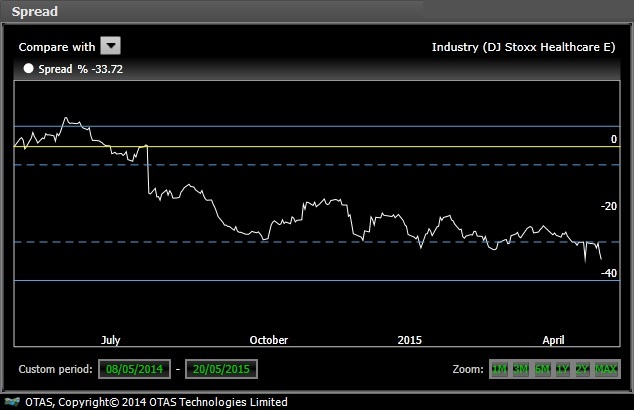 The spread of the stock price vs. the industry is +10% and above the 2 standard deviation level. The dividend yield at 1.86% is below 1 standard deviation vs. normal levels and at a 19% discount but it is well covered. The CDS levels have been rising over the past month, making the stock price and CDS levels divergent. We have also seen a sharp increase over the past week. While Implied Vol is higher than normal at a 12% discount to the industry vs. 19% last week, the absolute level has been increasing over the past week. However, we do see that investors are positioning themselves bullishly as the Upside Skew has increased implying people are paying more for upside and the Downside Skew has remained below 1 standard deviation, implying investors are paying less for downside protection. 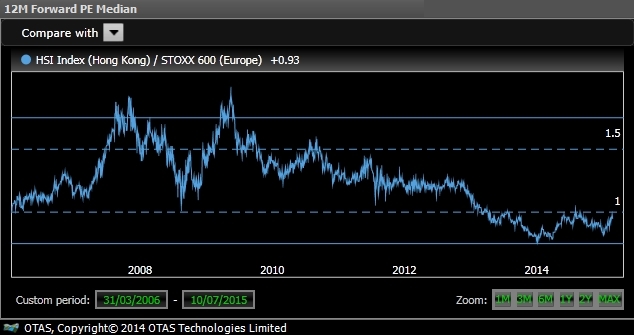 The Put Ratio has fallen below 1 standard deviation as people are transacting more in calls.